In The Beginning...Joe McFadden’s “Saints” had traditional halos around their heads as well as a halo “collar” around McFadden's signature stick-like necks. After more than 25 years and scores of one-of-a-kind “Saints,” the “halo collars” have become the perfect balance. "Last year a good friend of mine, William Souder, wrote a biography of John James Audubon. I was very happy to see that he was a finalist for the Pulitzer Prize. It is an excellent book. I was especially interested in Audubon’s long suffering wife, Lucy. While he was busily pursuing his bliss chasing birds, she was left destitute. Most of their married life was spent apart and she was charged with raising and providing for the children. Although he was absent, the memory of his wife and family made his work possible. In this piece I have presented her in a very domestic setting. Underlying the initial peaceful impression is the underlying conflict. Cats!!! 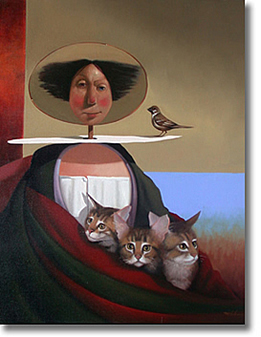 Her need for a financially secure life was a deadly threat to her vagabond husband’s work just as the seemingly harmless kittens are a threat to the bird." I think the more estranged we become from our primal past, the more an open flame calls to us." 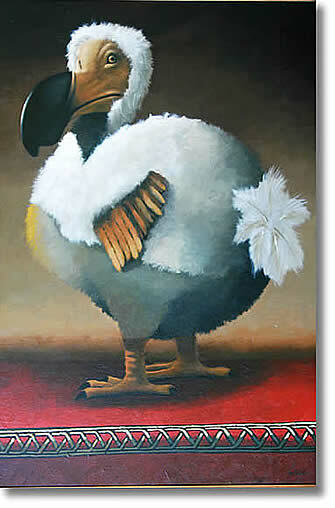 I have never understood why the term “Dodo” is used to describe an idiot rather than a helpless victim. I think a better insult would be “what a human!" 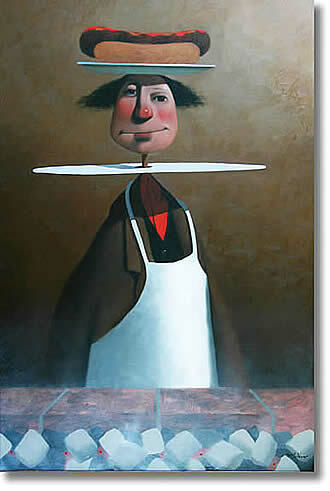 Contact Galleria Silecchia for more on American painter, Joe McFadden.